Cut cold butter into 1/4 tsp. cubes. By hand or with mixer, cream together the butter, brown sugar, sugar, salt and vanilla. When the mixture is uniform, mix (low speed) the eggs, graham flour, flour, and baking soda. Beat (medium speed) until well mixed. Expect the dough to be stiff. By hand, stir in the chips. You may need to work the dough with your fingers to distribute the chocolate chips evenly. Pinch off dough in pieces the size of large eggs and form into 24 balls. (If you prefer, divide dough in half, half again, and half once more. Divide each of the eight portions into three large balls.) Pat the balls to flatten them to about 3/4 in. thick. Straighten the sides to make disks 2 1/2 in. in diameter. Chill a minimum of 2 1/2 hours. You may leave the dough covered in the refrigerator for several days. 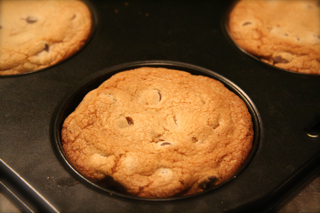 Preheat oven to 400º F. As the oven heats, place 6 disks in the wells of an ungreased muffin-top pan. Let them warm up outside the refrigerator for ten minutes or so before baking. On the second-to-top oven rack, bake one tray at a time for 10-12 minutes. The edges should be golden and the center 2″ of each cookie should still be light. Cool 15 minutes in pan. Twist each cookie in place to loosen it, and slide it onto a wire cooling rack.